The Royalton is a beautiful high-rise with 253 units and 27 different floor plans! Residents enjoy breathtaking views of Downtown from the East facing side of building, modern designed units, and storage rooms on balconies. 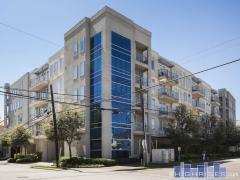 The Royalton is in a great central location with quick commute to all parts of town, easy freeway access and an especially fast ride down Allen Parkway to Downtown for work. The Royalton also has a high walk score, is close to River Oaks for fine dining and shopping, and is situated across the street from the newly renovated ($58m) Buffalo Bayou Project with 10 miles of hiking/biking paths stretched along the bayou, The Kitchen at the Dunlavy, and the new Johnny Steele Dog Park. Walk to Whole Foods and Big! Full service staff on-site offering concierge service for security and accepting packages, white-glove valet service where you can drop your car off and call for it when you’re ready to leave, a gorgeous pool for entertaining – all your friends will want to visit! Have any comments or questions about The Royalton? Ask your question and/or share your thoughts about this Building.